Lamb’s quarter is an erect, annual weed, 1-3 feet high; the stem often mealy, red-streaked. 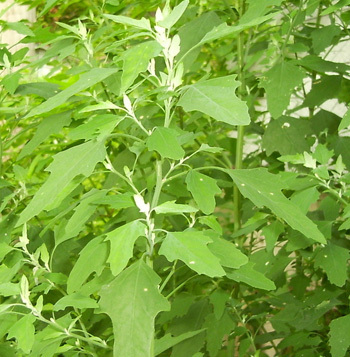 Leaves somewhat diamond-shaped, coarsely toothed; mealy white beneath. Flowers greenish-white, on densely flowered spikes, inconspicuous; in clusters; June to October. Found in gardens, fields, waste places. Throughout the United States. This weed found in most gardens makes a good spinach substitute. The young tops are pinched off and steamed in a small amount of water. The nutritional value is greater than spinach, and the flavor is similar. Foliage and seeds are edible. Although discarded by most Americans, not so the Native Americans. 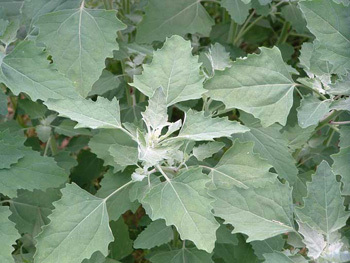 Lamb’s Quarters are a favorite among and gathered by Navajos, the Pueblo Indians of New Mexico, all the tribes of Arizona, the Diggers of California, and the Utahs. Boiled as an herb alone, or with other foods, large quantities are also eaten in the raw state.